Does history repeat itself? I fervently hope not. In one corner, we have a radical Marxist/Progressive, with little to no understanding of human nature and economics, who is on a tear to totally transform society to fit a bankrupt utopian ideology. In the process, he destroys jobs, strips companies of investment capital, destroys human capital, demonizes success, romanticizes failure, takes command of and promptly ruins entire segments of the economy, undermines the Constitution, blatantly disregards the law and does his very best to bankrupt the country while redefining entire segments of the population as dependent wards of the state. In the other corner, we have a square-jawed, well-coiffed, highly intelligent, erudite and successful businessman who made his mark in an industry demonized and under constant assault by the President. Formerly a Liberal, he now claims to be a Conservative, although large swaths of the Republican party refuse to accept his supposed conversion to conservatism as sincere. He is a nice, rational man who believes in using soft-spoken discourse to sway people and find common ground. Rather than go on a blistering attack in support of the capitalist, free-enterprise economy, he ends up trying to placate the population with his moderation and management credentials, while fending off internal strife within the Republican Party between those that promote strong advocacy of conservative principles and those seeking an accommodationist “middle way”. In many ways, he remains tone deaf to how others perceive him to be and how they react to his awkward choices of words. 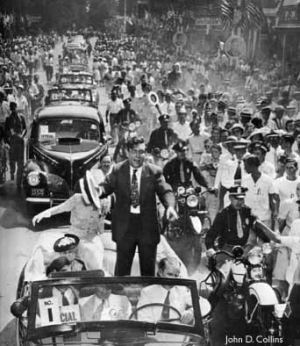 This man of whom I speak was Wendell Willkie. He ran against FDR in 1940 and got creamed by 5 million votes. Now, I realize there are many differences between then and now, but take a look at these photos below and please tell me they don’t suggest a spooky echo of the past.